Sign Up Here. It's Free! * 39% of StopMySmoking users have quit 4 weeks after their Quit Day. Results may vary. 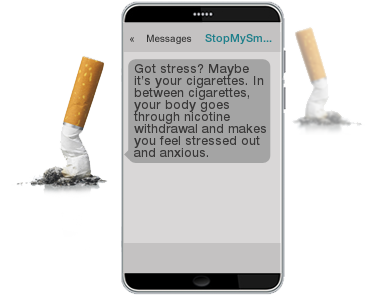 StopMySmoking is a text messaging program that helps you quit and stay quit. You receive messages are based on leading research and provide you daily guidance and support on how to stop smoking for good. FREE! users are saying about the program. - Jennifer, 21 years old. - Christopher, 24 years old. - Maria, 20 Years old. You should get the word out a little further about this program. More people need to quit! This program really helped me. It could help others. - James, 20 year old. Research suggests those who have a Buddy are more likely to quit. You can choose to be paired with someone else in the program who is quitting. You decide the times when messages are sent, so you don’t get messages when they might be disruptive. You have access to Text Crave, on-demand help to get you through cravings in the moment. Our Unique Features Put You In Control of Quitting. Get support in the palm of your hand when you need it most. StopMySmoking sends daily messages directly to your phone. Because each person is different, we have built a program that is customizable to your life and your schedule. * The content is solely the responsibility of CiPHR and does not necessarily represent the official views of the National Cancer Institute or the National Institutes of Health.